- Non-slip handle: The surface of the handle is covered with a soft, non-slip TPR material that is not only delicate in touch, but also non-slip and durable. - Uniform blade: The uniform linear blade design allows the ingredients to be stirred quickly when the dough is being made, allowing the food to be crisper and better in taste. - The stainless steel connection is tight and strong, not easy to fall off, and can be durable. Made of food-grade stainless steel, safe and healthy, strong corrosion resistance, higher hardness, heavy duty durable. It will not break, bend or rust. 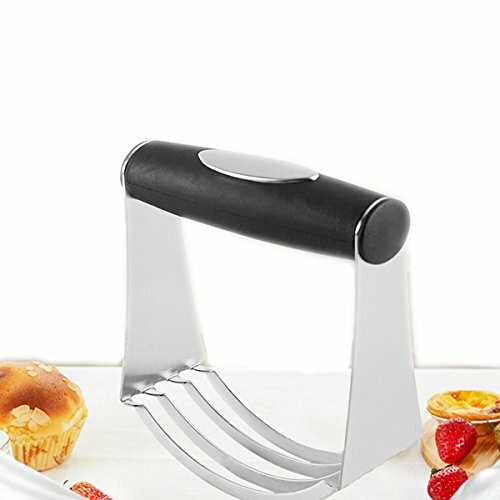 4-layer curved cutter head, quickly and evenly stir flour and butter, easy to use, simple to operate, save time and effort, easy to clean. The handle is ergonomic finger-contoured, comfortable to grip, effortless and non-slip. The soft handle absorbs pressure and won't spin or come loose in your hand. This blender with blades quickly cut butter or margarine into ingredients such as dough, flour, sugar or baking powder, combining. It can be used for kitchen baking, mixing, dough making and so on. If you have any questions about this product by TECHSON, contact us by completing and submitting the form below. If you are looking for a specif part number, please include it with your message.